Who says you can’t wear a scarf in the summer? Not us! We think that summer scarves are an essential item in your wardrobe. Even thought it’s hot outside, most buildings keep their thermometers at Arctic temperatures, so you’re glad to have something to throw around your shoulders. Personally, I can not stand it when the back of my neck gets cold. Literally, it sends chills down my spine. So having a chic scarf to wrap around my neck is the perfect solution. Our scarves come in a wide range of colors and materials. From the lightest weight cashmere to cotton and linen, we have a scarf that will keep you cool in the summer air-conditioning. It’s no secret that Stiles and Jonathan have a spectacular garden, and on a recent Saturday, Jonathan gave me a tour, which we’re sharing with you. It was a perfect day, sunny, with some fluffy white clouds scudding across the sky. There was a nice breeze and it was in the 70’s. We were accompanied by darling Sophie, whom you can see below. As we walked in from the drive, one of the first things Jonathan pointed out were some great old urns filled with a variety of flowers and plants. A little bit further along, there was another massive urn with a huge yucca plant in it. At this point, I should probably mention that Jonathan is an amazing gardener and he and Stiles have an impeccable eye for how the gardens should be laid out. As we wandered into the main gardens, Jonathan pointed out the parterres that will become the cutting garden later in the summer. There were dozens of dahlias grown from tubers that are waiting until some hedge trimming is done to be planted. Jonathan knew I had paid an outrageous amount for peonies last week, so he offered to cut some of theirs for me! They have two rows of white and hot pink ones, which were just at their height. In addition to growing flowers, Stiles and Jonathan also grow a wide variety of vegetables, including tomatoes, squash, beans, chard and lettuces. All are arranged in tidy tows with straw and hay between the rows to keep down on the weeding and to conserve moisture. There are also copious herbs including these chives which have just gone to flower. 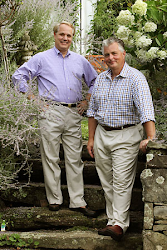 Stiles and Jonathan also have fruit trees, which they have espaliered in the traditional European style. The trees alternate pear and apples, and you can just see the fruits which have formed on this tree. I was playing around with my camera and captured this panoramic view of the vegetable gardens. As we headed back towards the house, I captured some more images. Last year’s gourds on a trellis, waiting for this year’s plants to grow. Outside the kitchen of the house is a small shaded patio which brims with plants and flowers! One of the spectacular pieces is this tree fuchsia. While commonly seen in hanging baskets, these trees make a stunning showpiece in the patio. Another stunner was the espaliered tree against a plain wall. This is a great technique if you don’t have room for a huge spreading tree. Thanks to Jonathan for the tour of the gardens! I am sure that you’ve remembered that Fathers Day is this coming Sunday, June 15th. And Halcyon House Antiques has just what he wants in our Gentlemen’s Room on the second floor. Here are some suggestions! Has your father carried the same wallet for decades? Maybe it’s time for a new one. We have a gorgeous croc-patterned leather wallet that he will be happy to carry! Does he carry around a lot of things? Maybe he lugs stuff down to the boat or out to the barn. Our waxed cotton bags are perfect for schlepping! Their leather handles and bottoms make these bags super durable. Is your father the elegant type? We have a beautiful selection of silk pocket squares to go with any mood that he’s in. Would your father ever wear a scarf thrown insouciantly around his neck? We have some beautiful equestrian-themed silk scarves for him. We have a selection of antique cufflinks from the UK, and great key fobs with dogs! Does your father like to grill outside? We have the perfect plates, glasses and cutlery, all of which are perfect for eating outside, because they won’t break! Regardless of what type of dad you have, we have just the perfect thing for him!